This vibrant mix of bright colors adds charm to any sunny garden space! Attractive, star-shaped flowers sit on a long, wiry stem with sword-like foliage. Each stem supports 8-10 gorgeous blooms! For maximum impact, plant en masse in borders, beds and perennial gardens. Long-lasting blooms are excellent for floral arrangements. Also called Spider Lily, or Surprise Lily, unique blooms appear in fall when most other plants are preparing for winter dormancy. Will naturalize over time. Foliage Type: Narrow, mid green leaves from the base of the bulb and shorter leaves further up the thin stems. 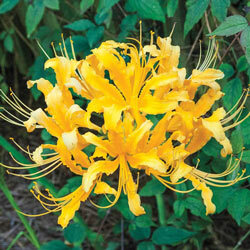 Flower Form: Star-shaped blooms with dark centers approximately 1/2 - 1" across. Planting Instructions: Plant 3 - 4" deep and 3 - 4" apart. Soil Requirements: Moderately fertile, well-drained soil in full sun. 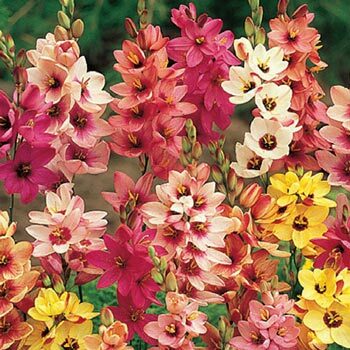 Winter Care: Must be dug up in fall north of zone 7, much like gladiolus and stored in a frost free area until spring.